3Q sales fell nearly 17% this year, driven by low inventory and higher mortgage rates even as prices continued to accelerate. The median sale price for detached houses increases 10.6%, year over year. Nearly half of listed homes sold for more than the asking price. Why are prices continuing to rise so strongly? Because unlike the stock market, real estate asset prices are sticky on the downside of a cycle and markets with strong fundamentals (like Boulder) are considered by many investors to be safe havens. During a call with a potential new client yesterday, she asked about $/SQFT, a key statistic in the Bay area. 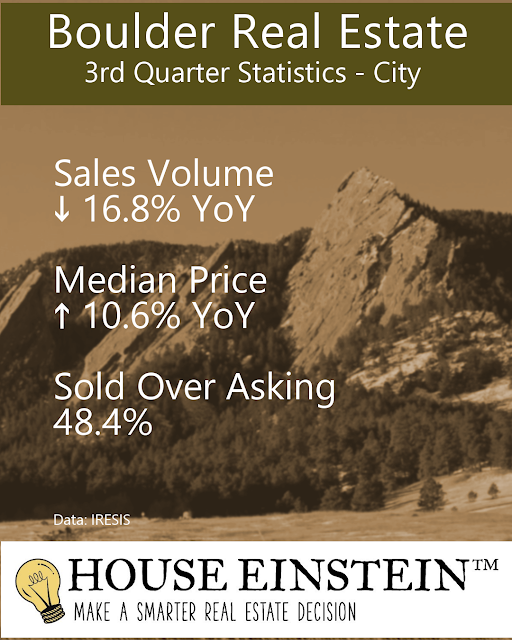 The median $/F.SQFT was $462 in the 3Q, compared to $405 last year, a gain of 7.4% year over year. As I mentioned to her, cost per square foot is a useful metric that buyers should always consider but to properly value a house requires placing a value on the location, design, finish quality and many other qualitative factors. Intelligent real estate decisions are based on deep market knowledge and experience. Note: Statistics are based on what sold or the inventory of listed homes, but doesn't reflect the value of your unique home. For a private consultation on the value of your home or to discuss your specific home search, give me a call at 303.746.6896.